Everybody talks about cryptocurrency and cryptocurrency investments nowadays. If you’re planning on launching a cryptocurrency blog, write online about Bitcoin and other digital currencies or create an ICO agency or cryptocurrency consulting business, these cryptocurrency themes are for you! These are premium cryptocurrency themes related to BitCoin investments and cryptocurrency services. 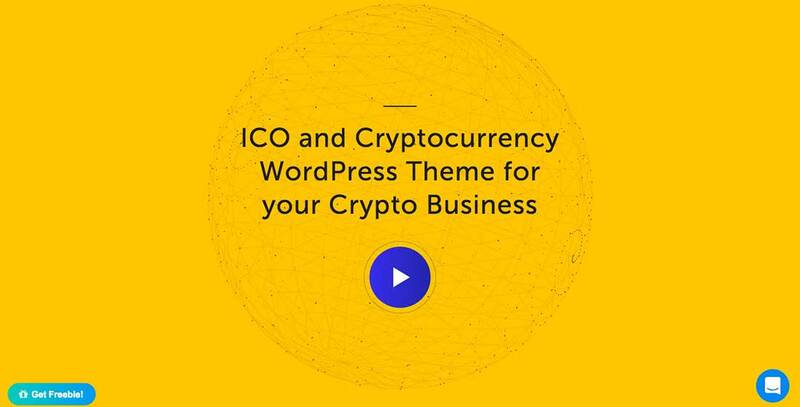 These WordPress themes have all the needed features required by both large and small cryptocurrency websites about ICO-Initial Coin Offering, blockchain technology, acquiring Bitcoin knots, and more. Most of these themes are powered by the popular WP Bakery (former Visual Composer) page builder, which means you will be able to create gorgeous, highly-customizable pages without touching a single line of code, all via the intuitive drag and drop interface. Other premium plugins may also be included along with the files of each theme, such as Revolution Slider which is one of the best WordPress slider plugins on the web. These cryptocurrency themes range from simple to complex, so you will find something you need, whether you’re looking for a high-converting landing page or a more sophisticated design for creating a cryptocurrency trading market. Check out these best cryptocurrency themes and choose the one that fits your purpose and has all the features you require. Cryptic is a great theme to create a cryptocurrency exchange market website. Perfect for businesses in the cryptocurrency investments and ICO agencies niches. 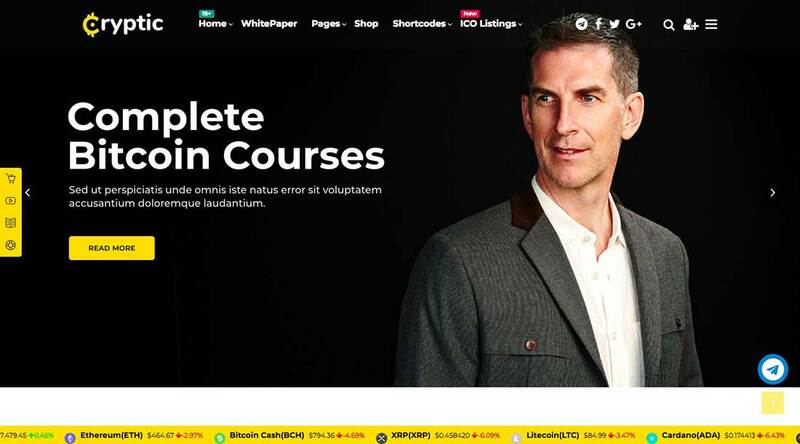 Tradent is a cryptocurrency WordPress theme for everything related to BitCoin investments and cryptocurrency consultancy services. 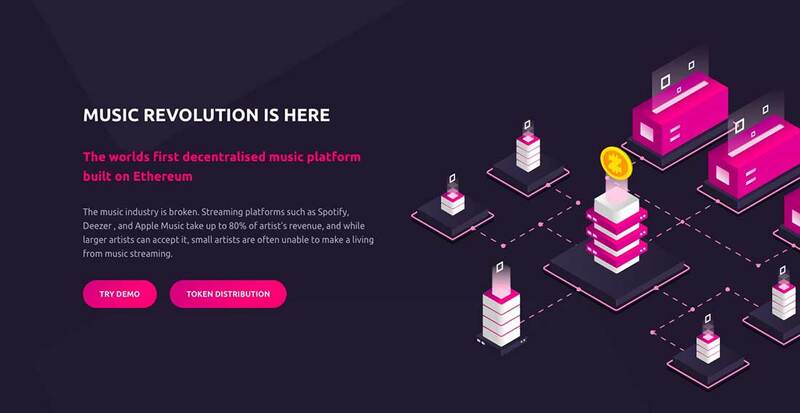 It can be used for ICO-Initial Coin Offering, blockchain technology, acquiring Bitcoin knots, and more. Crypterio has a CSV/XML compatible format so managing token distribution is facilitated. It lets ICO participants register, securely via a pass KYC/AML procedure. 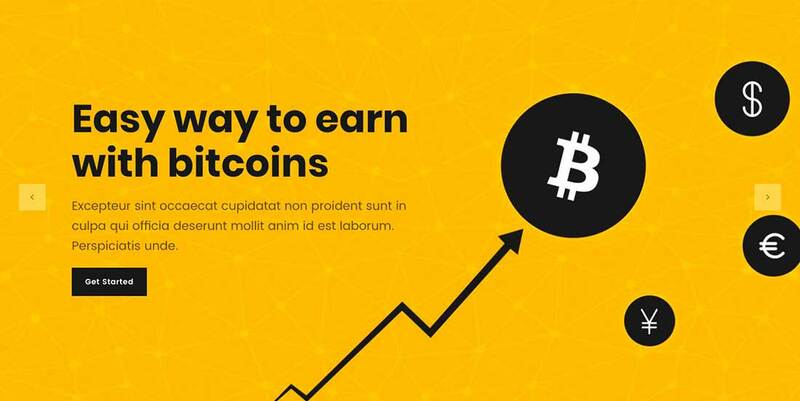 Cryptex is a WordPress theme created especially for a Bitcoin calculator website or a blog about digital currency, ICO events, and cryptocurrency in general. This theme has a fully responsive design that’s also retina ready. Has Ajax page transitions, a lot of features available through shortcodes and powerful options for all elements. Powered by the Visual Composer page builder. Cryptonite is a great theme for blockchain and cryptocurrency related websites. It can be used by both beginners and experts to create professional cryptocurrency websites. Lymcoin is another cryptocurrency WP theme for launching a cryptocurrency blog, write about bitcoins, present your blockchain specialist skills or even use it for initial coin offering (ICO). Use this theme to create a cryptocurrency trading market. 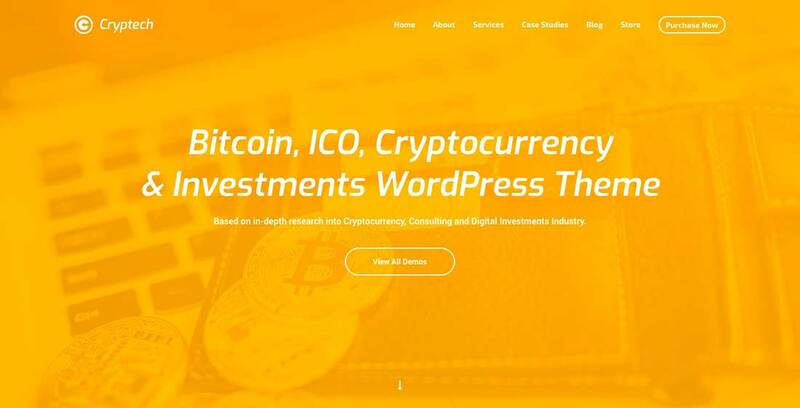 Cryptech is a versatile Bitcoin, ICO, cryptocurrency investments WordPress theme with a powerful interface and a clean design. Use it for anything related to digital currency and Bitcoin trading and investments. 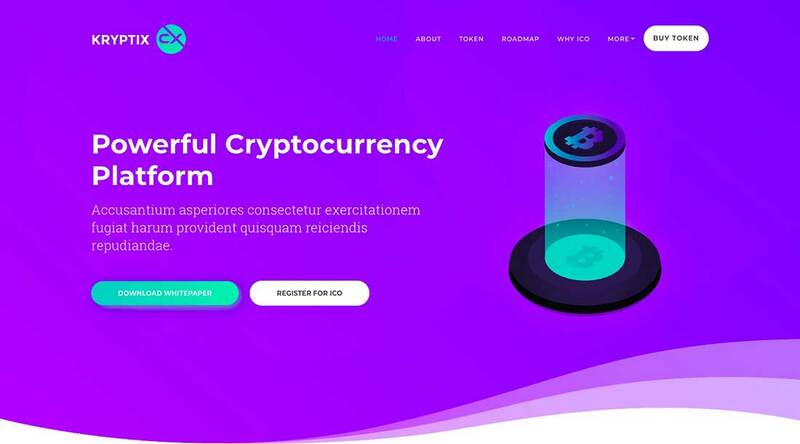 BitMin is a multipurpose WordPress theme for cryptocurrency websites. Use this professional theme for Initial coin offering (ICO), a virtual coin blog, coin miner or everything related to cryptocurrency. 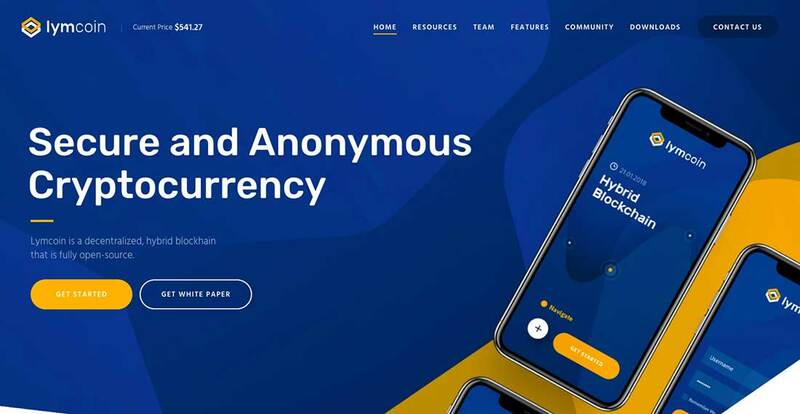 CoinzFactory is a bold WordPress theme adaptable to the cryptocurrency blogging niche or to be used as an ICO landing page, or even as aCrypto Wallet. 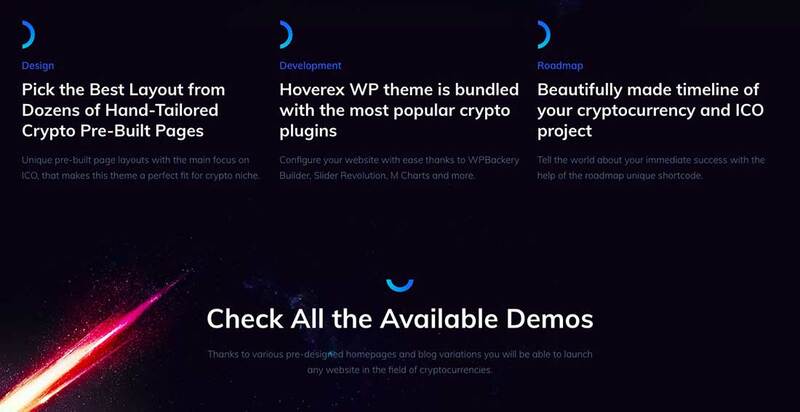 Hoverex is a cryptocurrency and ICO WordPress theme you can use to create a cryptocurrency blog about bitcoin, crypto coaches, blockchain specialists, initial coin offering (ICO), mining equipment sellers, ethereum, mining farms, or anything related to the cryptocurrency trading market. Coinmag is another awesome cryptocurrency magazine theme that even comes with a crypto widget ticket that lets your users see popular cryptocurrencies prices or price changes. 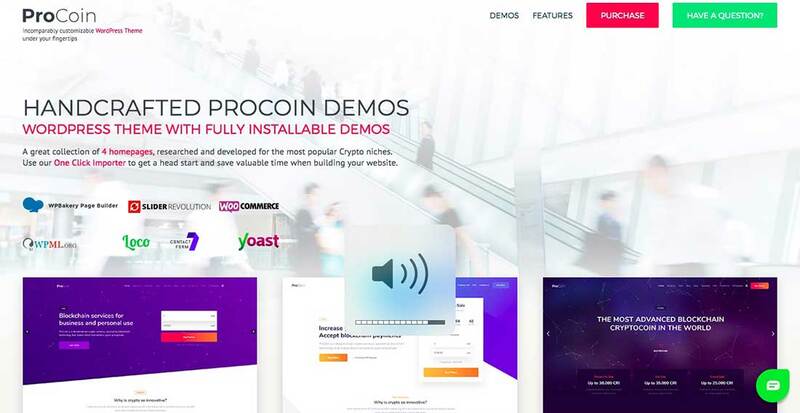 ProCoin is a WordPress ICO and cryptocurrency theme that can easily be adapted to any crypto related business. 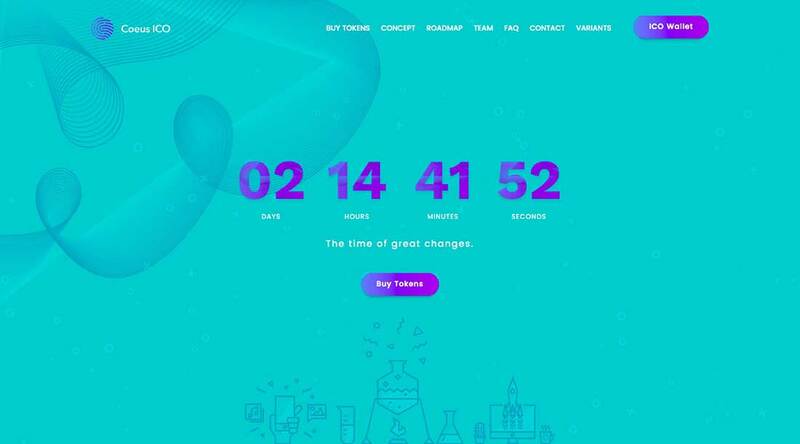 Cryptico is a premium WordPress theme for ICO Agencies and cryptocurrency investments companies. Use it with ease and impress your customers with its clean and interactive design. 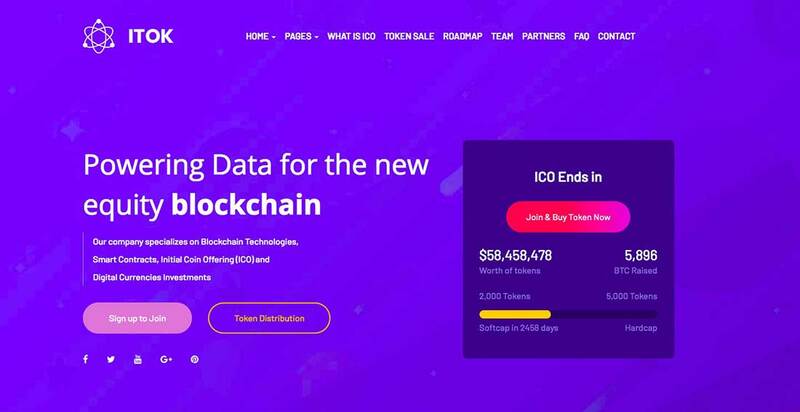 ITok is a high-converting ICO landing page and cryptocurrency WordPress theme. Easily customize it and adapt it to any type of digital currency consulting or crypto business. Kryptix is an awesome WP theme for everything related to Bitcoin, ICO & cryptocurrency. It is powered by Visual Composer, so editing the page layouts can be done using the Drag and Drop interface without any coding knowledge. It also has an integration with the popular Revolution Slider – for creating gorgeous sliders and has an advanced theme options panel. Crypton is a cryptocurrency WP theme for launching your cryptocurrency blog or magazine in minutes. Use it for any type of site related to blockchains, initial coin offerings (ICO), financial advisors, mining equipment, and cryptocurrencies in general. Coeus is a beautiful and highly converting landing page for WordPress. Use it for cryptocurrency landing pages. Use Bomex to launch your Bitcoin cryptocurrency & ICO (Initial Coin Offer) website. it comes with all the required features by digital currencies websites and is backed up by the powerful WP Bakery Visual Composer and Codeless Builder. 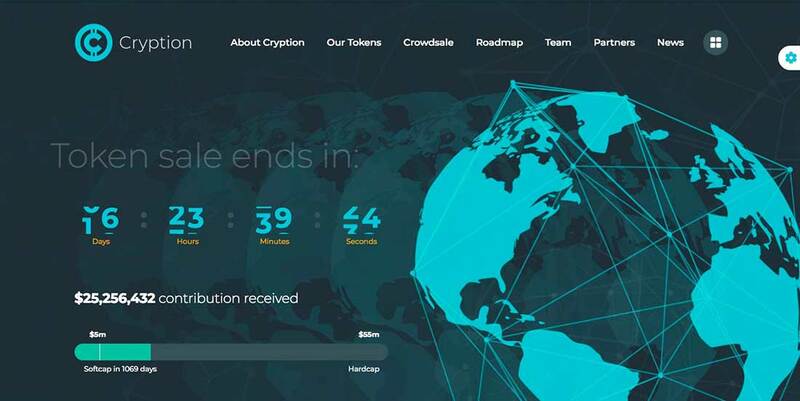 Cryption is a modern ICO landing page for ICO consulting and cryptocurrency businesses.